June 4th, 2013 – UBM Future Cities publishes Video on Visible Good by: Nicole Ferraro and Dan Allen – Meet Your New Disaster Relief Shelter. Newburyport Daily News: Port Company Sends Relief to Tornado Torn Oklahoma. 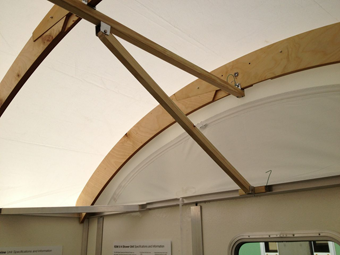 May 2013 – Newburyport Daily News – Breaking down walls Port company’s portable shelters ready to go global. After leaving Natick last Thursday, all thoughts were on Nemo (our blizzard) and how the two RDM’s would fare out in all that wind and snow. 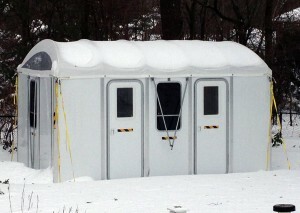 We have one set up in Natick MA and another just outside Boston. As of around 10:AM Saturday, the National weather service posts the snow total for Natick at 24.0″ and hurricane force winds in the area with much the same at site #2. We have requested Nemo weather data for the Natick base and will post that when we have it. In the meantime, it is great to report that the BOTH of the RDM’s that we left out in the cold did just fine. Neither suffered damage or leakage. The snow piled up all around them and left eddies in the wake of the wind, but none got inside. Just like superstorm Sandy – a real test. And they both passed with flying colors. Yesterday saw the third anniversary of the devastating earthquake in Haiti (January 12, 2010). After the quake, the world responded with an outpouring of aid, energy and money. Unfortunately, all sides recognize that much of that effort and money ($5.9B of the $9.8B USD pledged) has simply “disappeared”, without providing much value to Haitians themselves. When Tina and I were in Haiti this past August & September, we noticed that the people seemed so calm in the midst of so much mess and chaos. We wrote that if the pace of recovery in Haiti were to happen almost anywhere else in the world, there would be rioting in the streets. As this info graphic from the Huffington Post describes, the quake killed more than a quarter-million people and injured more than 300,000. Government and NGO sources cite that of the estimated 1.5 million people displaced, approximately 1.2 million have been relocated. That may sound pretty good, but the term “relocated” refers to many things, including temporary rental vouchers for some, super-crowded houses for others. Meanwhile, after thirty-six months, 300,000 people (or more), remain in camps with little or no idea about when (or if) things might change. These are camps with only very basic water, electricity or sanitation. Is what has been done “good enough”? What if you knew someone in one of those camps? We are continually looking for ways to improve the RDM. This blizzard gives us the opportunity we’ve been waiting for: we can test the prototype roof bracing system through some of the most extreme conditions the RDM has faced to date. We have two demonstration/observation RDM’s we have set up here in MA. Since we’ve been developing new bracing systems for our roofs, we decided that we needed to push ourselves and get one of our prototype roof systems onto the RDM at the Natick ARMY base NOW. So, we immediately got in touch with our contact there and spent some time this afternoon removing part of the old system and installing the new. The RDM has never looked better. The roof is tight as a drum and should shed the 14″ – 24″ of snow that is expected. And now the unit is strapped and staked as it should be to withstand a blizzard. Over the next few days, the RDM will be monitored by Army personnel. We’ll let you know how it goes. 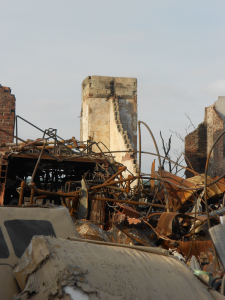 On January 4, Congress approved a bill partially funding Sandy relief efforts. However, the funding is less than 1/6 the amount requested by local, state and federal agencies in the midst of the cleanup. This is not a political issue; it’s more basic than that. We tell each other and teach our children that people should keep their promises. Our nation has promised to help our citizens in distress, but is now refusing to do so. People are still living away from their homes with friends or family – or worse, actually in their water soaked, nearly ruined homes in unsafe conditions. 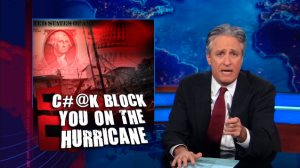 On January 7, the Daily Show with Jon Stewart berated a Congress that has been slow at addressing the horrible damage done to New York and New Jersey by Sandy and by their eventual failure to live up to our nation’s promises. Stewart was snarky and funny, but also seemed moved and very serious about the terrible consequences of a political system so stuck in its ideological bog that America’s leadership can’t see clear to doing what is right. If we don’t think government should help in these situations, we can debate and put it to a vote. But – as we tell any child – you don’t promise to help someone and then refuse to do so right when they need it. 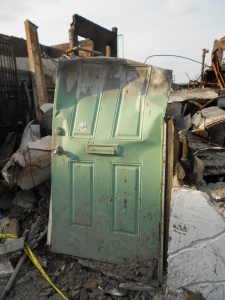 A few weeks back, we blogged about some members of the Visible Good team traveling to New York to survey the damage from Sandy and to see if/how we could help. 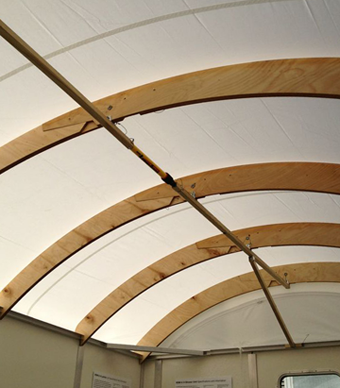 At the time, we all commented on the scarcity of tents, trailers and frankly any type of temporary shelter at all. More than one month after Sandy hit, many people are still seeking some kind of shelter. Despite a clear and present need, temporary shelters have not arrived there, citing a lack of space. The Huffington Post and The Brooklyn Daily Eagle published articles focusing attention on the lack of trailers or other temporary shelters in this heavily damaged section of New York. There are mobile help centers and rent subsidies, but there are no apartments available because so many buildings have been ruined. Due to lack of options, some folks have chosen to stay inside their storm-gutted homes, rather than move away. The long term consequences of living in a flooded structure can be catastrophic for anyone, including any emergency personnel that may have to enter to help. With winter coming on, these water logged shells, with no power or heat become more like moldy old refrigerators than homes. We hope Federal, State and local officials can see a way clear of this mess and begin to roll in with shelters so that affected residents can safely get back to their neighborhoods, repair their homes and get on with their lives. It has now been several weeks since the storm hit and almost two since our visit. According to both the news and our contacts in the area, little to nothing has been done about shelters on-site in the most devastated areas. For our part, we have been working through NYC firms familiar with the emergency response agencies and the political landscape in an attempt to get noticed and to gain a foothold there. However, progress remains slow and the task daunting. Even Federal and State agencies seem reluctant to bring in their trailers, citing insufficient open space. Indeed, the greatest presence we noticed while there was New York’s Department of Sanitation. They were literally amazing – bringing in equipment, helping to clean up, organize, you name it. We’ll see how things go for Visible Good – and any other shelter providers we hear of – in New York and write about it.